I think of Sekonic as I do Toyota. A lot of people love them and are devoted to them. They're definitely quality products and they often hang on forever. But while they're functional, they're generally not noted for their curb appeal and they lack that sense of romance that makes people love old Chevys or Buicks or Jaguars, or among meter users: Westons. The is my father's light meter, the one I learned on. He bought it in the mid 60s and it's still around. 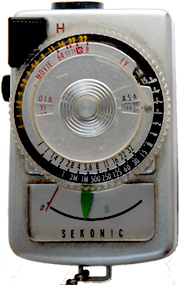 It doesn't do much—it's just a match-needle meter and a dial with the exposure combinations. But this one takes batteries instead of a photocell, and it still runs. The only real problem is that it was meant to take mercury batteries which can't be had in the USA anymore. The replacements are close but not exactly right, so the meter may not respond the same way. There's a K screw on the back so it could be adjusted, if you're so inclined. But I wonder how much it matters; it's not a professional meter. It wasn't going to be in the Conrad Hall's hand as he measured Katherine Ross's white dress for her bike ride in the country with Paul Newman. It was meant for amateurs with meterless cameras who needed to be in the ballpark. And it's fine for that.